Peru is located in the equatorial area of South America, but its climate does not correspond to its geographical location for two fundamental factors, the Andean Mountain Range and the cold marine current of Humboldt, also called Peruvian current. 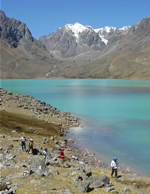 The Peruvian current and the geographical relief of Peru condition the climate characteristics in three big areas (from west to east), the coast, the Andean area or mountain, and the Amazon area or jungle, corresponding for each one of them particular climate characteristics. The highlands are much colder than the coast. A characteristic of the mountain region is the drop in temperature during the night. Temperatures commonly range around 24°C at midday before plunging to -3°C at night. The jungle features high humidity all year long. In the southern jungle, there are sometimes cold spells known locally as friajes or surazos, cold fronts which drift up from the far south of the continent between May and August, where temperatures can drop to 8-12°C.